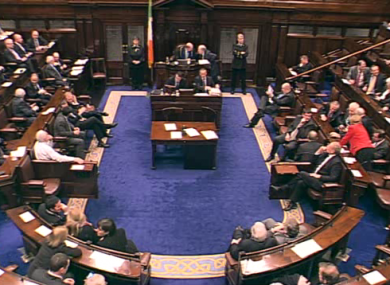 TDs debated proposed amendments until after 11pm last night – amid complaints that not enough time had been allocated. TDs had one of their latest nights of the year last night - staying until after 11pm to vote on approving a new Property Tax. LEGISLATION TO INTRODUCE a new property tax on homes was passed by the Dáil last night. TDs voted to approve the new Local Property Tax Bill, and all proposed government tweaks to it, by 85 votes to 47 in a vote held after 11pm last night. The vote followed three-and-a-half hours of debate – and prompted opposition complaints that insufficient time had been offered by the government to discuss opposition suggestions on amending the Bill. Opposition TDs had tabled 88 amendments, as well as seeking votes on the removal of 93 other sections of the Bill – but only three amendments were considered before the government forced through its vote at 11pm. The ‘guillotine’ had led opposition TDs to appeal for extra time to debate the Bill, arguing that there was no need for the legislation to be sped through before Christmas when the new Property Tax would not be levied on householders until July. There were no defections from any political parties on the issue; Labour chairman Colm Keaveney, who last week was ejected from the parliamentary party for opposing cuts to the Respite Care Grant, did not vote. All TDs from Sinn Féin, Fianna Fáil and the United Left Alliance, and all independent TDs who were present and voted, opposed the Bill. The Bill will be debated in the Seanad between 7pm and 9pm last night, with discussion on proposed Seanad amendments set for 2pm on Thursday. The Government projects that the new tax will bring in €250 million next year, when it takes effect in July, and will reap €500 million every year thereafter. Email “Dáil approves introduction of property tax in late-night vote”. Feedback on “Dáil approves introduction of property tax in late-night vote”.